* * UPDATE * * See the Super-8 documentary from 1976 that helped save Moss Island from destruction by the NYS Thruway! 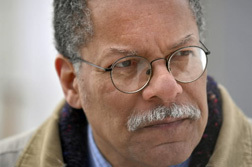 Made and narrated by Paul Stewart (well known locally for his work with the Underground Railroad Project) includes footage of The Wife, who assisted Paul with the filming. An important historical artifact! On hot, dry summer weekends, The Wife and I like to put our personal water craft on top of the car and go exploring. There’s an amazing number of places in and around Albany to put in our boats, a boater’s paradise if you know where to look. Our boats gulp no gas and can take us anywhere that’s wet, so we get to see a strange and wonderful view of the Capital District that most people never get to see. We tend to forget that the City of Albany exists because of all of this water. We sit at a major junction of waterways, an industrial highway that can float you from New York City inland all the way to Green Bay, Wisconsin. That’s why we call ourselves the Empire State, because without New York’s waterways we wouldn’t have had much access to the rest of the empire. Once upon a time, that is. Since gasoline is cheap and plentiful and will never run out, these waterways have been mostly abandoned and replaced with dry, hard highways. A small number of barges still regularly run the waterways. There are signs that this sort of commercial water traffic is increasing, particularly on the Hudson, such as can be seen by the recent revival of activity at the Port of Albany here in the South End. At present these waterways are a kind of industrial near ruin, still functioning on a low level but barely being used at all. Some of the stonework that we see when the two of us paddle about dates back to the late 1700s. Most of it is from the 19th century or early 20th century, so well built that the system still functions adequately with little improvement and minor maintenance. Ever since I started shacking up with The Wife more than two decades ago (or was it two hundred years ago? I forget.) she’s been chattering about Moss Island. This is indeed a rocky island covered with moss, located in the Mohawk River an hour or so west of Albany at the City of Little Falls. Here we find both Thruway exit 29A, as well as Barge Canal lock number 17. Back when The Wife was 19 or 20 years old she got involved with saving Moss Island from imminent destruction. It seems that the civic leaders of Little Falls desperately wanted shiny new bridge across the Mohawk River so as to link their economically depressed community to the Thruway. The Thruway planners, true to form, declared that the bridge had to straddle and destroy the main features of Moss Island. The year was 1974. The Wife collaborated to save Moss Island with Paul Stewart, well known today around Albany, mostly for heading the Underground Railroad Project among other things. 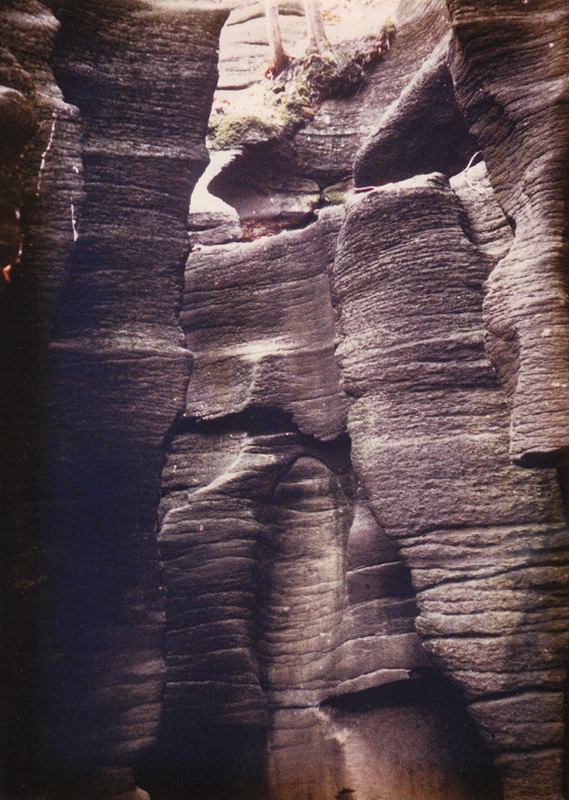 The two of them clambered over the rocks and made a short super-8 film of the island’s amazing features. This film was meant to help publicize the imminent destruction of the island, using what was back then cutting edge technology to get the word out. Neither of them can remember if the film was ever aired anywhere, surely it must have been. And yes, we recently found the film in our basement, apparently in good shape. One day soon we will find someone who can convert this super-8 artifact of ancient times into a modern digital format. When we do, you can all get to see it. So one early Sunday morning in July we drove her canoe and my kayak to Little Falls to look for a spot to put our boats into the Mohawk. We arrived via the controversial Thruway bridge, which was finally built in an admittedly elegant curve that skirts around the island. Yes, the effort to save Moss Island was successful, and it is now a local tourist attraction that puts Little Falls back on the map. After gassing up at a local diner and after some poking around Little Falls, we stumbled upon a shiny new harbor facility recently constructed by the City. It had lots of docks, a small boat launch, a fine building with facilities and tourist information, an interesting fountain and places to picnic. It even had an honest to goodness Harbor Master on duty to answer our questions. The only thing missing was publicity. We found no reference to this great little facility in any tourist or boating information, not even on the internet. As a result, it looked terribly underused. Our plan was to paddle over to the far side of Moss Island to see the rock formations known as potholes in the rock cliffs, properly visible only from the water. We had a problem, though. 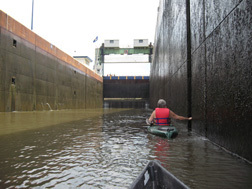 If we wanted to reach our goal, we would have to get through Lock 17, the third highest lift lock in the world. Before we attempted to traverse the lock, we went to find the lock master of 17, a friendly fellow with a Russian accent named Sergei, to find out if we could actually do such a thing. It turns out that all pleasure craft can lock through for free, anytime. And the lock master seemed more than happy to break the monotony, since there was almost no traffic on the river that morning. Funny thing about that. For most of the day we were literally the only boats on the river. Perhaps the complete lack of commercial craft on a weekend is not unusual, although they work the Hudson seven days a week. But here we had a warm, sunny Sunday in July and for most of the day not one boat of any kind out there besides ours. I guess that pleasure boating for has “suddenly” and “unexpectedly” gotten too expensive. For no particular reason, marine fuel has always been 50 cents to one dollar per gallon more expensive than terrestrial gas. Having a paddle instead of a motor is much more economical, and it is a much quieter experience, very pleasant. Back in the 1990s, the administration of then governor George Pataki completely gave up supporting commercial use of New York’s waterways. Instead, Pataki’s handlers came up with the notion of promoting this amazing water highway primarily as a tourist attraction. Now this pathetic policy, which had never really gotten off the ground, has completely collapsed and failed with the rising cost of fuel. Pataki could have promoted commercial traffic by, for instance, dredging out the clogged Champlain Canal (which connects Albany to Montreal) and by investing in modernizing existing facilities such as the Port of Albany. Instead, the dingalings around Pataki came up with the 1996 so-called Environmental Bond Act, which was used primarily to build new sewer lines to promote sprawl. A good portion of this debt generator was used to promote “water tourism” on our great neglected system. Up and down alongside the Hudson and Mohawk Rivers are these great boat launches with parking lots and grassy lawns, all paid for by the Bond Act. Any town run by Republicans received piles of cash to build these launches, the City of Albany, for example, got nothing. These facilities are for pleasure craft only, they are utterly useless for commercial activity. Indeed, the day before we put in our boats at the Coxsackie boat launch and crossed the Hudson. Among the many wonders we saw that day was a sand cliff poked with hundreds of little holes, and every once in a while we would see a bird that resembled a sort of colorful starling emerge from the holes. It’s a great location safe from predators and curious children, but I wondered how stable this sand condo fared in severe weather. But coming back across the Hudson the current was tremendous. When we finally made it back to Coxsackie, The Wife dragged her boat ashore and threw herself down on the grass, moaning. 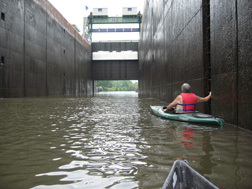 I thought she’d had enough of boating for the weekend, but here we were the next day on the Mohawk paddling up to Lock 17. 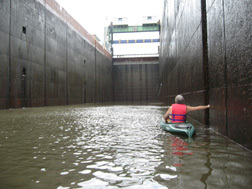 Normally a boat has to call ahead or sound a horn to request use of the lock. But thanks to the lingering effects of the Pataki administration, the master of Lock 17 had little to do. 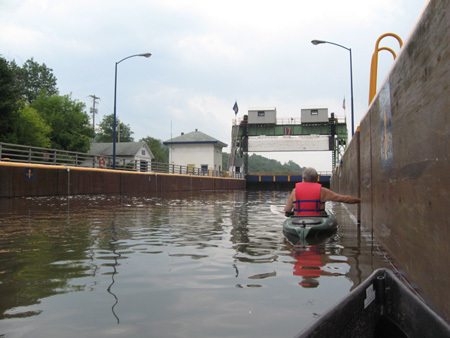 So he was waiting for us up above as we paddled up to the doors of the lock, and we idled at the red light while the lock filled with water. Finally the doors opened and we paddled inside. I gotta tell you it was really cool, all this wonderful and mostly unused massive industrial equipment operating for our two puny little boats. It felt like a slow motion carnival ride as we hung on to the sides of the lock and dropped some forty feet. After the lock emptied, the counterweight dropped on the far end and the door lifted open. We paddled out and there was Moss Island, all ready for our inspection. 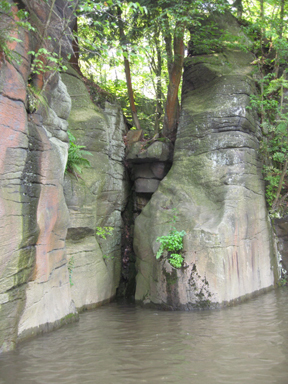 We rounded the island and there, as The Wife promised, were the rounded rock cliffs rising out of the water. It’s hard to adequately describe these carved basalt formations, and most photos don’t do them justice. At first glance they look human, like some sort of grandiose and demented art project. But something about the shapes, the graceful curves, suggests that these are shapes no human mind would have thought of. We were looking at the open ends of the many potholes carved into the basalt of Moss Island. These potholes were formed after one of the periods when New York was covered by a mile thick sheet of ice, not by the ice but by the melt water. the accepted notion is that the island was once the base of an enormous waterfall, one that put Niagara Falls to shame. Where the water poured steadily, it drilled holes into the stone. Have you ever seen a flat stone under a rain down spout, how the water makes a depression where it hits the rock? Imagine a down spout as wide as the Thruway coming straight down from the clouds, shooting water day and night without pause at the same spot. Imagine a lot of these giant spouts, pounding at the solid rock for who knows how long. Tens, hundreds, thousands of years? Eventually the glacial melt water went away, leaving the strange rock. Some of the potholes are easily 50 feet deep. And they appear to continue into the earth, their bottoms concealed by sediment or standing water. There are pothole formations all along this side of Moss Island. We rounded the island and found the flats in back of the old hydro power plant, and studied the discharge pipes, noting the lack of a fish ladder. this was as far as we could go. Little Falls began at this spot because of the rapids, a place where water travelers had to stop and portage. The first canal around the rapids was built in 1793, believe it or not. This project was incorporated into the Erie Canal when it was built in 1825. We saw some of the characteristic fitted stonework of the original canal rising out of the water. I’m delighted to know that some of what I saw was even older. It’s hard to believe, living as we do in our engineered to be disposable society, that stonework built more than 200 hundred years ago is still in active use today. In the 19th century Little Falls became an industrial center, primarily because of the abundance of rapidly moving water to power the engines of industry. But in the 20th century renewable sources of energy such as the rapids of Little Falls were abandoned. Instead, we use petroleum, which can be controlled and distributed by corporations. An interesting fact I learned recently was that it was because of places like Little Falls that Adirondack Park was created in the 1880s. It was noted that the rapid water of upstate New York which is so ideal for ideal for industrial use was in danger of drying up if the mountains to the north were clear-cut and stripped of trees. While conservationism played a big public role in formation of the park, it was the factory owners that pushed for preservation behind the scenes. Well, the industrialists are long gone, most to China or Abu Dhabi I suppose. We saw several industrial buildings that appeared to be occupied, but the buildings turned blank walls to face the river. They could have been located anywhere, they didn’t need the waterway. Only the old power plant on one side of Moss Island still makes use of the river. And on the other side of the island the highest lift lock in New York State, the third highest in the world, is in excellent working condition. The lock master is ready waiting for the boat traffic. I believe it will come soon. 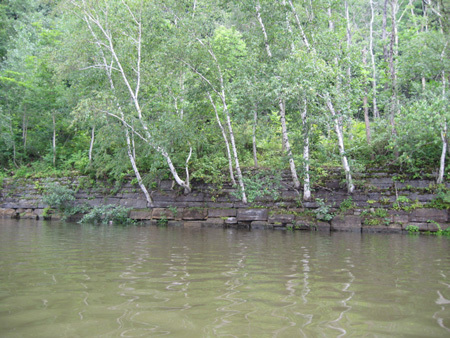 Click here to see more photos of Moss Island and Lock 17. This was an absolutely fascinating article, and has inspired me to learn more about the canal. Thanks for writing it! Utilizing the hydropower is very difficult today, as the laws surrounding energy generation are fairly complex, and are designed to accomodate large-scale corporate operations. You must improve your spam filter. I have not looked at any of the posts for today except Roger's and his wouldn't come through. You might want to screen the other posts though. Nice article ont he canal. I too found it inspiring. Fascinating article, and wonderful photos. Also appreciate your prior post on FISA, and second the sentiments. There is a strong possibility for National Geographic to consider the promotion of Moss island as a topic for coverage.On an average, the magazine takes on sixty or so assignments for inclusion in their journal.With your permission, I would be delighted to receive from you as many photos of the island which would be delivered to their editorial offices. I am especialy interested in those shots taken from the river on the north side.You will of course receive credit for your work if published.Obviousely the photographer of NG will be extensively covering the subject. But consideration for other material may be accepted. In any event, I would appreciate at least whetting their appetite in advance of their hopeful arrival here in the Mohawk Valley. Thank you in advance for the courtesy of a reply to my request. I am a strong believer that the glacial rock formations were formed as the result of the abatement of the Noahic flood waters. 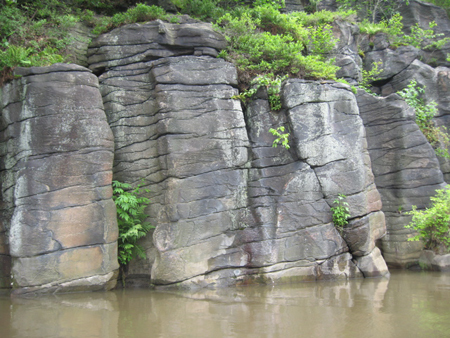 Geologists claim that the Sea of Little Falls once covered these hills surrounding the valley. But, as common sense would tell you, a sea does not simply disappear. But it did and no other reason can be attributed to its absence than the biblical account associated with the flood that once covered the earth.The so-called famous "pot-holes" were formed from the turbulence of swirling currents and eddies that caused great rocks and boulders to grind away the dolomitic surfaces. I have uncoverd the cutting stones from many potholes; shapes of each reduced dramatically in size. I've just come across your article and I'm truly sorry I hadn't seen it before. It was very enjoyable and the pictures were fantastic. I've never seen better. I've been a Little Falls resident since 1982 and am still amazed how many native residents know nothing about Moss Island. (You and your wife missed it by a month) where we offer walking tours of Moss Island; a kayak trip around Moss Island; Boat Tours though Lock 17 to the General Home; and a canoe and kayak competition. Little by little, Moss Island is being discovered for the treasure it is.